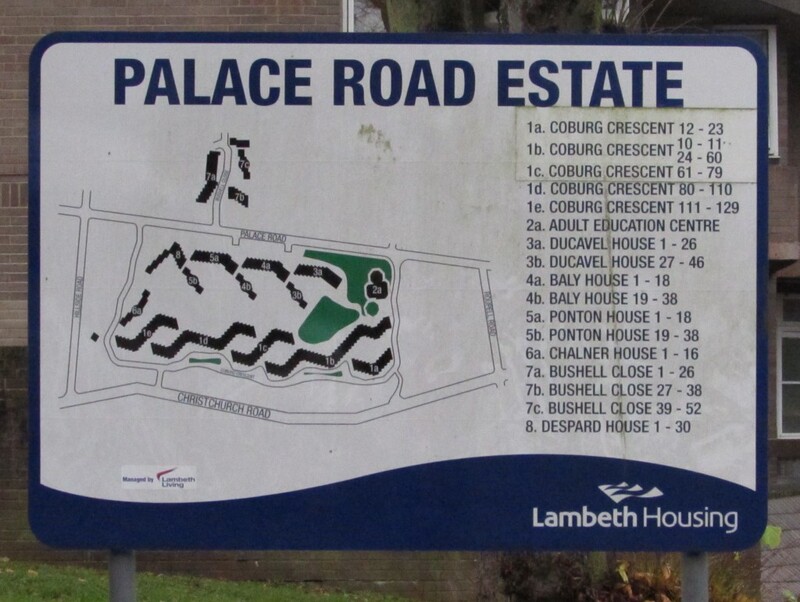 The Palace Road Estate lies at the north-western end of Palace Road in the London borough of Lambeth. It was built by the Greater London Council in the early 1970s on the sites of a number of large houses that had become dilapidated. It was designed by Sir Roger Walters KBE, the Chief Architect at the Greater London Council. The estate is bounded to the north by Coburg Crescent, which meets Palace Road either side of a gate that blocks Palace Road. A section of the estate is to the south of Palace Road, on Bushell Close. Accommodation includes flats and maisonettes, mainly along Palace Road and Bushell Close, and terraced houses along Coburg Crescent. There are large areas of grass between the residential buildings and many mature trees, including fruit trees. Next to the estate, on the south side of Palace Road is a public park – the Palace Road Nature Garden.